New leads are essential for an insurance agency to grow and thrive in today’s competitive market. So, how do you build your business for the lowest cost per lead? 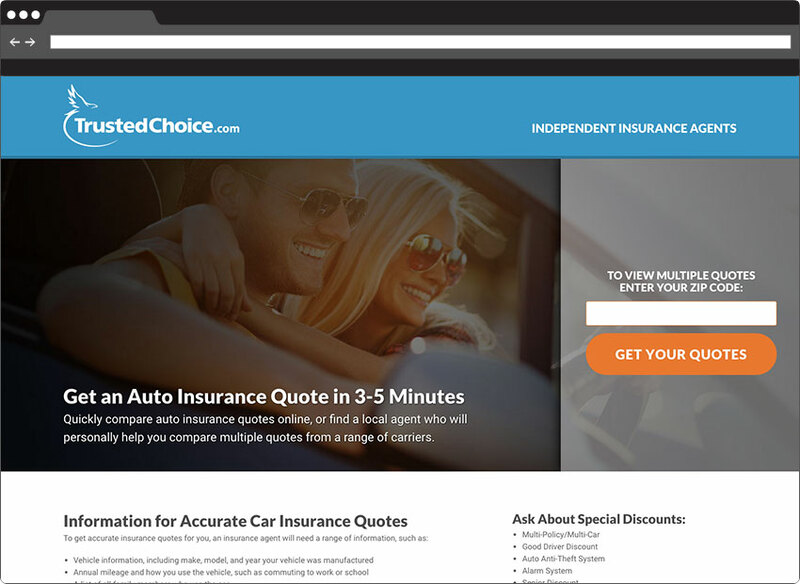 Here at ThinkSEM (a preferred vendor of TrustedChoice.com), our digital marketing professionals are experts at lead generation for insurance agencies. We know that agents are too busy serving clients to spend time and money trying to master Internet marketing. We harness the power of the Internet to bring new prospects to your door — qualified prospects that you can contact and convert into agency clients. CRO (conversion rate optimization), including landing page design and landing page testing. Everything we do is designed to generate leads and maximize performance. No matter what types of insurance you focus on, we work with you to ascertain your goals and work to get you the leads you need the most. As with any type of marketing, there’s no one-size-fits-all approach. We blend different aspects of what we do so that it works best for your specific agency. Already have a great web presence but you’d like to try PPC marketing? Let us know. Want us to polish up your SEO? We’d love to. Has it been a few years since your last web design iteration? Tell us what you’d like to see change. We’ll even work on beefing up your local search presence. From actuarial tables to claims processing, the insurance industry is numbers-based and data-driven. Why should lead generation be any different? Our insurance clients appreciate that we base our recommendations on hard numbers and years of experience; not on wishful thinking or the latest online marketing trend. We will assess your existing online presence with a web audit, and from that data we’ll give you straightforward recommendations of how we can help you reach your Internet marketing goals. Each month, we will report on your progress. We won’t just throw numbers at you — we translate the data and performance trends we are tracking into meaningful information about your Internet traffic, leads, new clients and cost per conversion. Are you ready to turn your web presence into an effective marketing tool? Call 651.200.3831 or contact us by email. Located in the Minneapolis-St. Paul area, ThinkSEM generates online leads for insurance agents and agencies in Minnesota and throughout the U.S.